Northeast Whitewater: Moosehead Lake Adventure Destination: Get out of the city Labor day weekend to go rafting in Maine! 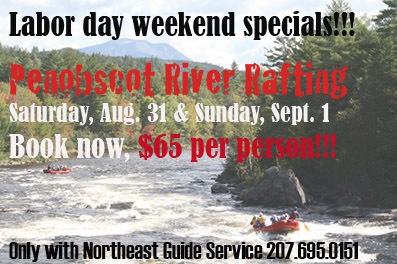 Get out of the city Labor day weekend to go rafting in Maine! Need an incentive to get out of the city for Labor day weekend? Go rafting in Maine with Northeast Whitewater Rafting! Labor day weekend is your chance to relax. Kick your feet up. Enjoy time with friends and family. Your hard work has paid off and now you need to reward yourself with a weekend away to Maine for some fun in the sun, barbeque and Maine white water rafting on the Penobscot river. Regular price to raft on the Penobscot river is $114 per person. Our reward to you is an incentive to sign up for rafting on either Saturday, August 31 or Sunday, September 1 for only $65 per person. Don't miss the boat and get in on the white water savings today by calling 207.695.0151.